Osteonecrosis (called avascular necrosis or aseptic necrosis) is a condition where blood supply to the bone is impeded or disrupted. Bone needs circulating blood to regenerate and repair, without blood flow the bone dies. Loss of blood flow to the hip is a leading cause of the hip degenerative disease and the need for hip replacement surgery. One treatment option in avoidance of total hip replacement is core decompression. Core decompression is considering a “joint sparing” surgery. If it works, there can be an avoidance or delay of hip replacement. The core decompression surgical procedure involves drilling a hole(s) into the femoral head of the hip to relieve pressure in the bone and hopefully create new blood vessels to nourish the affected areas of the hip. The overall success of this treatment is unclear. A research team from Canada and the United Kingdom issued troubling findings in patients where core decompression failed and a subsequent total hip replacement was required. 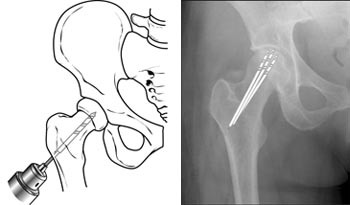 The doctors, writing in the Bone and Joint Journal, looked at core decompression and insertion of a tantalum rod into the hip joint for stabilization. 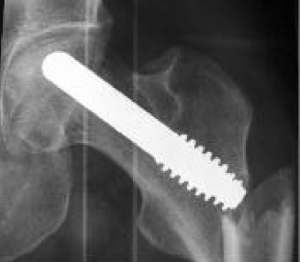 The doctors were concerned that there may be a high failure rate associated with this procedure and examined failed tantalum rod insertion patients and their move to and subsequent hip replacement outcomes. Common sense should tell us floating metallic debris in the hip is not optimum and reminds many of the metal on metal hip replacement recalls. What concerned the Chinese researchers was that the deterioration of early failed tantalum implant exceeds the nature of osteonecrosis progression. In other words, the implant caused accelerated hip degeneration. In other words, the concerns of the Chinese researchers was how fast the surgery failed and caused stress fractures in the bone it was designed to preserve. American Academy of Orthopaedic Surgeons Illustration of (Left) Core decompression. (Right) In this x-ray, the drill lines show the pathway of small drill holes used in a core decompression procedure. Doctors in Germany examined “Advanced Core Decompression,” a new option that tries to remove the necrotic (dead) tissue in patients with osteonecrosis of the femoral head in a minimally invasive way by the use of a percutaneous expandable reamer (a drill) and refilling with a resorbable and osteoinductive bone-graft substitute. Simply, a better drill and filling the drill holes with bone grafts. The better idea did not work out. This examination appeared in the April 2017 issue of the Journal of tissue engineering and regenerative medicine. Seventy-two hips of sixty patients with a mean follow-up of 29 months after Advanced Core Decompression were examined. The femoral heads collapsed in 24 cases (33%). Another way, incorporate PRP Platelet Rich Plasma and Stem Cells into this surgical procedure. Patients with grade I or grade IIA avascular necrosis of the hip are treated by core decompression performed by drilling under fluoroscopic guidance. Liquid platelet-rich plasma (PRP) is delivered through a trocar, saturating the necrotic area. In more severe conditions, the necrotic bone is decompressed and debrided, through a cortical window at the head-neck junction. A composite graft made of autologous bone and PRP is delivered through the core decompression track. Fibrin membranes are applied to enhance healing of the head-neck window and arthroscopic portals. Platelet-rich plasma is infiltrated in the central compartment. This is not a widespread adapted procedure. 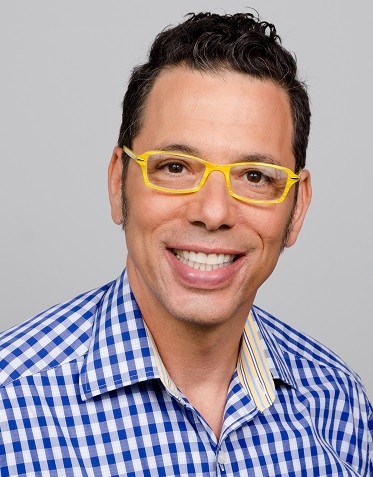 It is what is called in medicine a “novel approach,” meaning new, unusual, not regular procedure. This research was hardly followed up. In 2017 Doctors at the University of Milan also examined the role of bone marrow aspirate during core decompression surgery. In their study in the medical journal Efort Open Reviews,(6) they cited the 2016 work of Greek and English researchers in the journal Acta Orthopaedica (7) showing that the application of autologous bone marrow concentrate in combination with core decompression is superior to core decompression treatment alone, as it was found to markedly decelerate the progression of the disease to the stage of femoral head collapse. 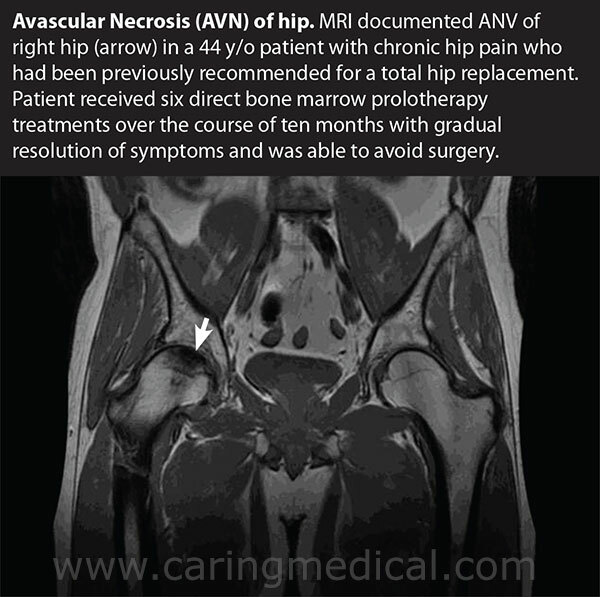 This procedure also limited the need for total hip replacement, particularly when employed in the early (pre-collapse) stages of avascular necrosis of the femoral head. 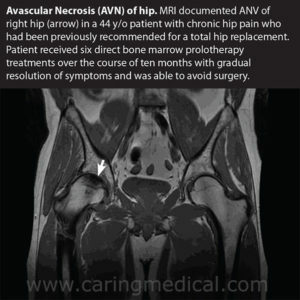 The diagnosis of avascular necrosis should not mean automatic joint replacement, nor should its diagnosis need to be a “life-altering situation” in many cases it can be managed with the comprehensive approach of dextrose Prolotherapy, Platelet Rich Plasma, and Stem Cell Therapy. Since the time of that paper, validation has come from dozens of papers. Doctors writing in the European review for medical and pharmacological sciences had this to say over a seemingly new weapon surgeons could use to make surgery more successful. In other research, doctors confirmed that stem cell therapy for bone regeneration worked outside of surgery. These findings are among the many research papers of the last two years that support the idea of bone regeneration in necrosis patients. 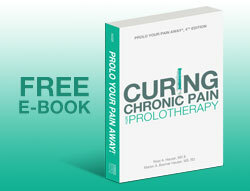 The standard treatments for AVN seemingly lead to a singular destiny – joint replacement. But are there realistic options? 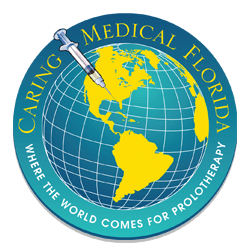 Case studies started to appear in the medical literature which explores Platelet Rich Plasma and Stem Cell Therapy as possible solutions to bone death. 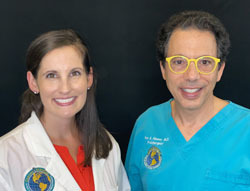 In our own clinical experience, we have seen similar results in patients who were given two options only – bilateral core decompression surgery or bilateral total hip replacement surgery. Patients should have been given the non-surgical option. 9. Hauser R, Ostergaard S. Direct bone marrow injections for avascular necrosis of the talus: a case report. 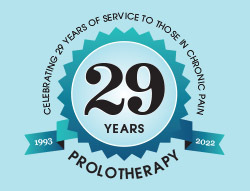 Journal of Prolotherapy. 2012;4:e891-e894.